Our Instructors – Your safety is our primary concern! All instructors at World Martial Arts Academy are required to successfully pass a criminal background check conducted by the FBI and Illinois State Police. World Martial Arts Academy Instructors have also been finger-printed by the Kane County Regional Office of Education. Grandmaster Ramon R. Ribay (pronounced Ree-bay) is a highly experienced martial artist with over 50 years of training across multiple styles including Shotokan Karate, Arnis/Eskrima/Kali, and Aikido. He is one of a few native Filipino Grandmasters of his generation actively teaching in the Midwest. He began his study of the martial arts at age 12 in the Bikol Region of the Philippines. One of the pioneers of spreading Filipino Martial Arts around the world, Grandmaster Ribay was dispatched by the Philippine Sports Commission to Japan, Korea, and the United States for demonstrations and cultural exchanges. 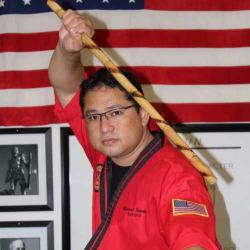 With expertise in a wide range of systems, Grandmaster Ribay has trained with many influential martial artists from around the world, including the late Grandmaster Remy A. Presas, founder of Modern Arnis. In the 1970s, Grandmaster Ribay competed successfully on four continents in national and international tournaments, including the International Karate Championships in Long Beach, CA. As a non-commissioned officer in the National Intelligence and Security Authority, he was a tactical combat instructor for the Philippine Airforce and the Philippine National Police Academy. In the 1980s, Grandmaster Ribay was employed by the United States Sports Academy. He was stationed in Saudi Arabia, where he taught martial arts to the Royal Saudi Airforce, and also served as a strength and conditioning coach. Upon completion of his duties in Saudi Arabia, Grandmaster Ribay moved to the Fox Valley Area. He was named Instructor of the Year in 2013. Master Phil is a life-long practitioner of the martial arts. His initial interest was sparked by Sunday afternoon television broadcasts of old Kung Fu movies. At age 7 in his hometown of Las Vegas, NV, he joined a “Korean Karate” park district class, taught by Shotokan and Taekwondo Master, J.J. Reis, Jr., a retired U.S. Naval Commander who served in the Vietnam and Korean Wars. Master Phil earned his 1st Degree Black Belt during his senior year in high school and continued his martial arts training in college, serving as secretary and assistant instructor for the Stanford University Taekwondo Club. Always interested in broadening his martial arts experience, Master Phil also participated in the Stanford University Aikido program. Upon graduating with a BS in Electrical Engineering, Master Phil headed to Denver, CO, where he joined Strantz Taekwondo, which was known for its success in Olympic-style competition. From Denver, Master Phil moved to the Fox Valley area, where he earned his MBA from DePaul University. Master Phil established a martial arts program at a local gym in St. Charles and co-founded BAM! Self Defense, a group which taught basic self-defense at the St. Charles Park District. A Hall of Fame Inductee, Master Phil has coached and officiated at local, state, national, and international competitions, and served as Vice Chairman and Vice President of various state associations and committees. Master Rodolfo T. Poblacion, Jr. comes from a martial arts family. His uncle, Grandmaster Romeo Tabano, founded the Martial Arts Training Center of the Philippines (MATCOP) in 1975. Many world-renowned martial artists of all styles visited MATCOP back in the day including Hirozaku Kanazawa, and Antonio Ilustrisimo. It was at MATCOP in the early 1980s that Master Rodolfo studied Shotokan Karate under our very own Grandmaster Ribay. 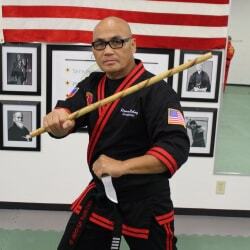 Master Rodolfo’s martial arts resume is extensive and includes induction into the 2012 Philippine Martial Arts Hall of Fame, where he was named one of the Top Ten Filipino Martial Artists. 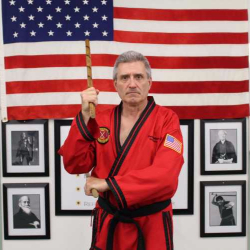 He has competed, coached, and officiated Karate and Arnis tournaments for many years. His expertise in Modern Arnis has brought him all over the Philippines, as well as Hong Kong and the United States to conduct seminars. As an officer of IMAFP, he has been instrumental in organizing several of the FMA (Filipino Martial Arts) World Festivals that have taken place in the Philippines. For his contributions in spreading Filipino Martial Arts and culture in the short time he has been in the Chicagoland area, Master Rodolfo was inducted into the Chicago Filipino Asian American Hall of Fame in 2016. In the prior year, he was named World Martial Arts Academy’s Most Valuable Person. 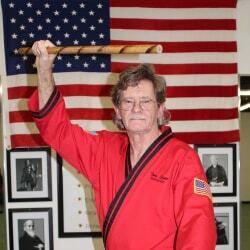 Instructor Mark has studied the martial arts for over 40 years. He is a Chicago native and has been a resident of the Fox Valley area since 1970. 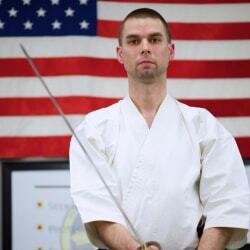 Instructor Mark has experience in Isshin-Ryu Karate, Gracie Jiu Jitsu, Aikido, and Taekwondo. More recently, he has been studying the internal and healing arts of Tai Chi, Qi Gong, and Reiki. Instructor Mark and his wife, Connie, own Inglenook Pantry Catering, serving up delicious meals for your special event! 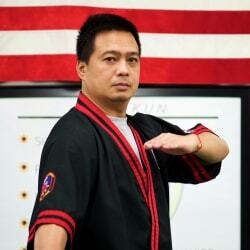 (www.inglenookpantry.com) Instructor Mark he was named World Martial Arts Academy’s Most Valuable Person in 2014. Instructor Jake has studied multiple martial arts including Mixed Martial Arts, Shotokan Karate, Modern Arnis, Taekwondo, and Aikido for over 20 years. He received his 1st Degree Black Belt at age 9. A former and once-again student and long-time friend of Master Phil, Instructor Jake has competed successfully in local, state, national, and international competitions. Under Master Phil’s coaching, Instructor Jake was a 3-time Illinois State Champion, and a medalist at the Junior Olympics and the North American Open. Instructor Jake entered the American Line Builders Apprenticeship Training program at age 20. He credits much of his success in the lineman field to the confidence, discipline, and focus he developed in his martial arts training. He became a Journeyman at age 23 and a Foreman at age 25 for ComEd’s contractor of choice. He has been on the front lines of recovery efforts for hurricanes including Gustav, Ike, Irene, and Sandy, and Irma. 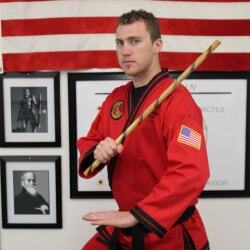 In 2013, Instructor Jake was named World Martial Arts Academy’s Most Valuable Person. Instructor Mareus began his study of the martial arts in his hometown of Dumaguete in the Philippines. He, along with his brother, studied a combat-style of Filipino Martial Arts derived from Mas Oyama’s Kyokushin Karate and the hand-to-hand techniques of Escrima. Instructor Mareus received his 1st Degree Black Belt over nearly 20 years ago after successfully passing his promotion test in which he had to demonstrate unarmed defenses against attackers with real knives and swords. Instructor Michael has been training in Martial Arts for over 20 years, beginning with Karate in Muncie, IN. He has trained extensively in the art of Aikido for over a dozen years, earning a rank of Nidan. During this time, he supplemented his Aikido training with Taekwondo and Japanese Jujutsu. He also studied Japanese weaponry — Jo, Bokken, and Tanto, as well as the basics of Kenjutsu (Sword Combat) and Iaijustu (Sword Drawing Combat). A math and music teacher turned anesthetist, Instructor Michael balances martial arts with career and family life. He generously shares his experience with us and is a key component of Aikido instruction to adults and advanced students. Instructor Tom is a life-long student of the martial arts. He has studied multiple arts throughout his life including Shotokan Karate, Tang Soo Do, Judo, Taekwondo, and Wing Chun. Instructor Tom was introduced to many of these styles during his service in the military. He had the privilege of training with Modern Arnis founder, the late Grandmaster Remy A. Presas, during his Chicago seminars in the 1990s. He retired several years ago from the Kane County Judicial Court, where he worked in the Drug Rehabilitation Program. © 2019 · World Martial Arts Academy USA Inc. | Martial Arts Websites by Conversion Strategies, Inc.